Oil on canvas, 31" x 25¾" (79 cm x 65.5 cm). By repute, the painting comes from the collection of the Hermitage, St. Petersburg, and it was subsequently sold at Lepke, Berlin, at some time in 1922 or 1923. Mr. J. A. Vandenburgh, The Netherlands and Andover, Massachusetts, until 1957. This painting may convincingly be associated with the work of Juan Carreño de Miranda, one of the outstanding figures of late Baroque painting in Madrid. While traditionally given to Jusepe Ribera, the picture’s exuberant, thinly-applied brushwork, and its elegantly restrained but rich palette place it firmly within the context of the Madrid school during the second half of the 17th century. 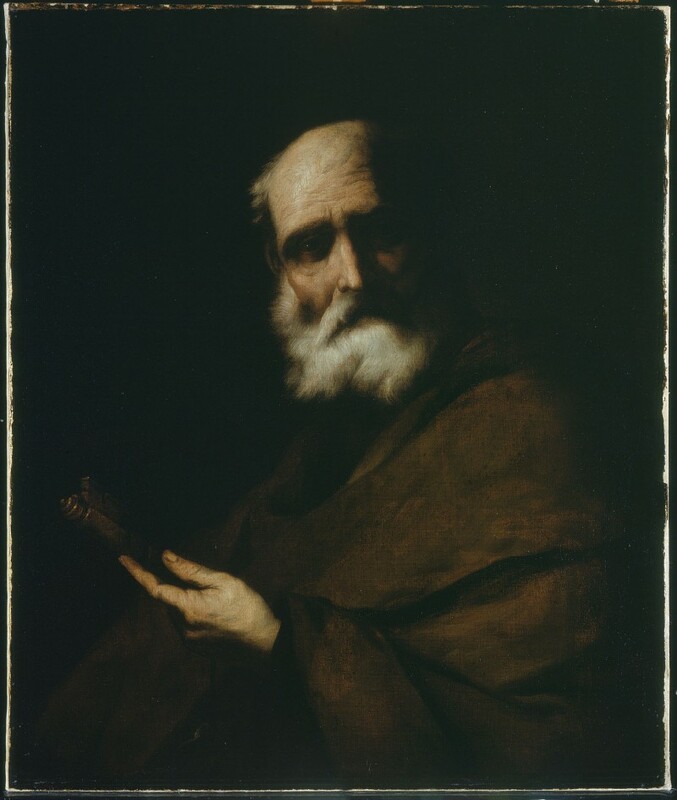 Indeed a clear parallel may be drawn between this St. Peter and the main figure in Carreño’s Flaying of St. Bartholomew, signed and dated 1666, which is based on Ribera’s famous engraving of 1624. (For this painting, which is in the collection of the Meadows Museum in Dallas, see Painting in Spain 1650-1700 in North American Collections, exhibition catalogue, Princeton and Detroit, 1982, no. 8, pp. 64-5). 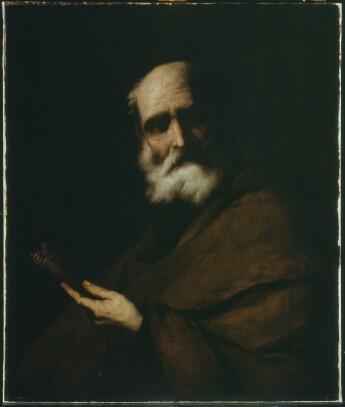 A drawing by Carreño of St. Peter, destroyed in 1936, which may be related to the present painting was in the collection of the Instituto Jovellanos in Gijón (see A. E. Pèrez Sanchez, Catálogo de la Coleccion de dibujos del Instituto Jovellanos de Gijón, Madrid, 1967, no. 358). Long-lived and prolific, Carreño was the chief portrait painter at Court during the reign of Charles II, having been appointed Pintor del Rey in 1667, succeeding Juan Bautista Martínez del Mazo, who, in his turn, had succeeded his father-in-law, Diego Velázquez. Carreño was equally proficient producing portraits and grand religious compositions, both on canvas and in fresco. He executed the decorations of many of the important churches in Madrid of the period, including San Antonio de los Portugueses, a major project which he did in collaboration with his pupil, Mateo Cerezo.